Actually all my lute videos are concentrated here since autumn 2015! In the late renaissance (c. 1580-1600) and in the baroque (c. 1600-17??) periods many different types of extended lutes were popular. 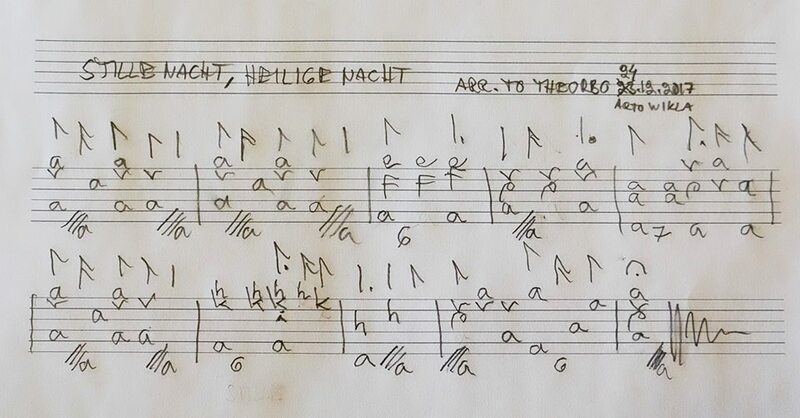 One group of these was called by names archlute, arciliuto, liuto attiorbato, .... Common to this group was that the courses on fingerboard were tuned in the old "renaissance way". Robert Spencer's article Chitarrone, Theorbo and Archlute is a well written introduction to these extended lutes. Balletto: my edition (fol. 62v-63r) (pdf). In this edition the trillo(?) markings of the original (uppercase "T" with a dot to the right) are replaced by lowercase "t"'s. 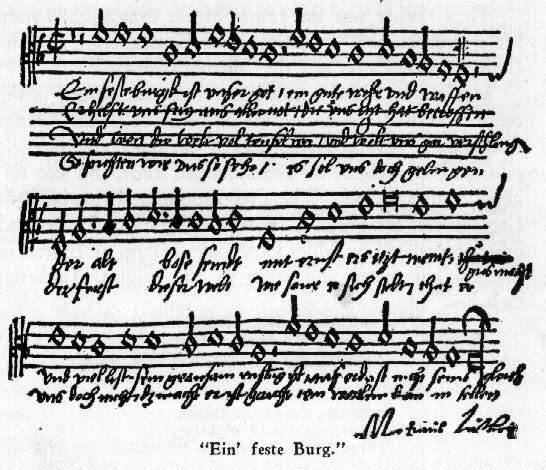 The ms. 40032, fol. 153v/p. 361 (pdf). Thanks to Arthur Ness for pointing me this much clearer version! Arthur also told an interesting fact: "By the way, the Contessa [Marchessa] di Sala was the beautiful Barbara Sanvitale née Sanseverino. Fabritio Dentice was one of her musicians." Partly improvised version of a very famous and beautiful (ba? )rock song. Just in case someone is interested, here is my ms. that I have in front of me in the video. 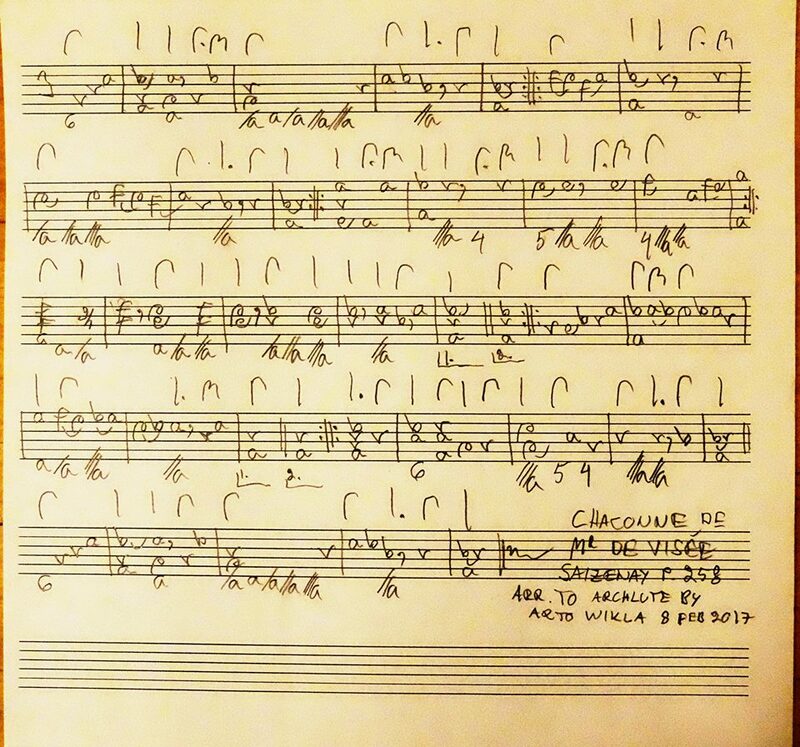 I had planned to play two verses, but when the recording already had started, I decided instead improvise a "prelude" and play only one verse and repeat the A part at the end. New instrument, the Harz model archlute made by Lauri Niskanen 2016. [Well, the opposite of archlute ;-)] Antonio Vivaldi: Largo (RV 93). 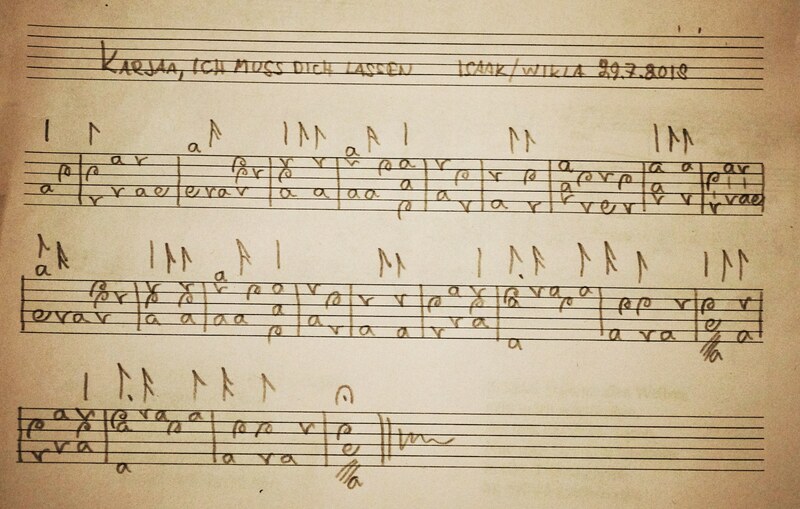 This is my arrangement to solo lute of the Largo in Vivaldi's Lute Concerto in D-major (RV 93). The soprano lute in d is made after model "Wendelio Venere", Vienna, c.1580, by Timo Kontio, 1997. Played by this lute the key is G-major. Here is my old (2008) arr to lute solo - all 3 parts - of this concerto. Six course lute in "renaissance tuning" in whatsoever pitch is enough! Video in YouTube (1.4.2016). 5 Galantina ensemble rehearses before the evening's concert in Parikkala, June 28 2016. 6 Galantina ensemble's concert in Vihti, July 14 2016. Martti Peippo, traverso and recorder; Anna-Mari Ablouh and Johanna Honkanen, baroque violin; Anniina Saarikko, baroque cello; Arto Wikla, archlute. Friday evening's whimsy ;-). In 7pm I started to arrange, in 8:15 pm I recorded this whimsy ... ;-) ... and yes, I do know there are some differences ... Here is my arrangement (jpg). Video in YouTube (2.9.2016). Arcangelo Corelli: Sarabanda Largo . The model of my archlute arrangement is in the Sonata VII, Corelli's Op. 5. Arranged this evening and recorded right away. Here is my arrangement (jpg). Video in YouTube (8.9.2016). 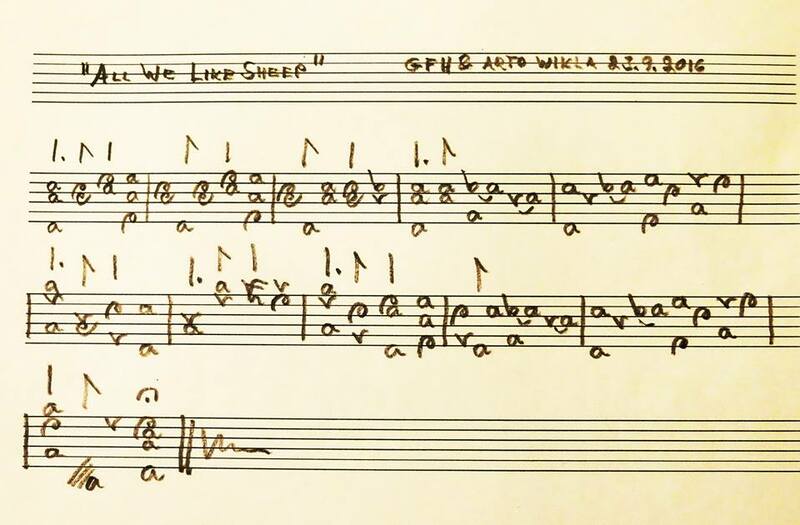 Handel: "All we like sheep" (fragment). My tiny arrangement of this famous gastronomical(?) piece by hungry(?) Georg Friedrich. Here is my arrangement (jpg). Video in YouTube (23.9.2016). Unprepared Passacaglia improvisation. 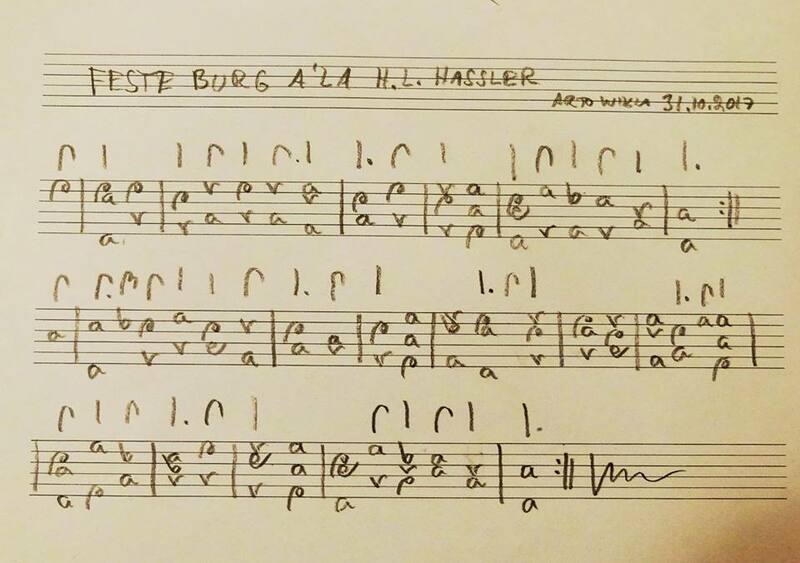 My wednesday evening's honestly unprepared improvisation on the Passacaglia bass line in d is dedicated to a certain lady..;-). Video in YouTube (19.10.2016). - "There is no music." 24 I Wish You a Merry Holiday!. See also my pages 11-course lute music / French theorbo music / 10-course lute music / Chitarrone music / Chitarrino music.